I am delighted to have been asked to support and tutor the 64 hours European Competition and design workshop based on the Living Building Challenge to be held in Trento, Italy, April 2015. Below is abridged flyer info from organisers Macro Design Studio. 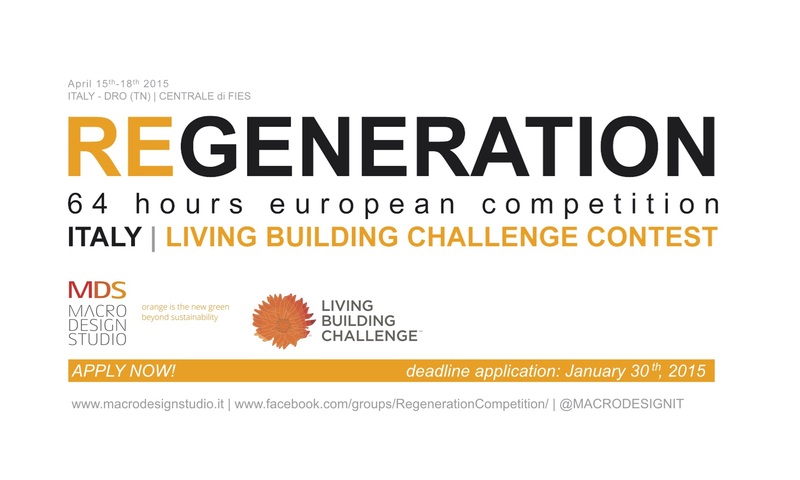 Macro Design Studio in collaboration with ILFI is proud to organize REGENERATION, a design competition in Europe entirely based on the Living Building Challenge protocol. Every team should respond to specific requirements defined in the announcement Integrative design, synergistic development of the project and sharing of expertise are necessary prerogatives to tackle this challenge. Selection of 15 young participants is open via the Application Form with a deadline of January 30th 2015. This entry was posted in architecture, sustainability and tagged ILFI, Living Building Challenge, REGENERATION on January 6, 2015 by martin brown. So here it is. A blog about architects. There are three things I want to do with this blog, things I have been doing elsewhere on the internet for some years but in a pretty unco-ordinated way it must be said. Firstly, I want to help explain what it is that architects can do, what they are good at (and not so good at), how you can use them to get where you want to be with your property, and of course, what they should be doing differently. Secondly, I’m a bit of a networking nut and very keen on using the internet for networking, so I’m taking the opportunity to investigate how the construction industry is and is not using the internet, so there will be plenty of opinionated posts about that too. Lastly, I’d like to ask the people who read this for your suggestions on what I should blog about. If you know me already you might have some ideas, and if you don’t, take a look at what I’ve got to say and let me know what’s missing. In good networking parlance, if I don’t know myself, I can find out who does. This entry was posted in architecture, Blogroll, blogs, built environment and tagged blogging, blogs, justpractising on January 12, 2009 by martin brown. a smart eco house that daydreams? Following recent communication with Adam Somlai-Fischer at Zuiprezi, who I hope can get to talk at the be2camp event in October, I took a look at the Reconfigurable House, a concept environment developed by Adam constructed from thousands of low tech components that can be “rewired” by visitors. So far so good, but reconfigurations can be made endlessly as people change their minds, so that the House can take on completely new behaviours. Smart homes actually aren’t very smart simply because they are pre-wired according to algorithms and decisions made by designers of the systems, rather than the people who occupy the houses. if the House is left alone for too long, it gets bored, daydreams and reconfigures itself…. The Reconfigurable House is open source, registered through Creative Commons which seems to allow you to download the code and create your very own reconfigurable home, or upload your own configurable devices into the house suite. Arguments as to who has control of the remote may take on a whole new dimension. This entry was posted in architecture, futures, housing, links, open source, technology, web2.0 and tagged be2camp, usability, Zuiprezi on August 10, 2008 by martin brown. I attended the SCRI event on Service User Innovation in Salford Uni’s new Lady Hale Building yesterday, listened to four influential speakers and participated in thoughtful discussions and break outs. The investment in really engaging with and empowering end users is impressive. Five years in the case of John Zeisel in understanding Alzheimer’s needs in the USA , a huge investment from Sainsbury’ s and the patient work in understanding pupil and teacher needs from Manchester City Council. None of these three examples start with the building, but with the users. Why then as an industry do we fool ourselves we can do the engagement stuff with one or two value management exercises and a POE? I was not alone in noting an under theme of web 2.0 in the presentations and discussions. There was the mention of pupils using second life to determine space and colour requirements, of the use of Web2 (twitter maybe, blogs, or facebook groups) in getting real, unsolicited, feedback from facilities users. I sensed though it was something to put on the wish list and get on with the business in hand. It is a pity this was an under theme as to me as is where the real service user innovation lies. Service users make use of web2 technology outside of the work place, ie in second life, in twittering, in facebook, in myspace … etc etc etc. The innovation is in using this in design and facilities management. We seem to be blind to or just awakening to its potential. The potential to allow continuous dialogue between service users and service providers / designers This is not rocket science – those using twitter can contact the government on issues (and get a response) and be kept in touch with the Prime Ministers actions, speeches and even thoughts. And then where – consumers constantly in dialogue with a supermarket on store layouts, on colour, on products and costs – office users ditto with the fm’s on suggestions and wc complaints – pupils on school design, residents on city facilities and urban design – on eco town developments, and all in real time as it happens. This entry was posted in architecture, benchmarkwalks, built environment, comment, community based fm, facilities management, innovation, second life, virtual worlds, web2.0 and tagged barcamp, biophilia, Dunbar's number, post occupancy evaluations, SCRI, service excellence on June 27, 2008 by martin brown. A web2 collaborative project I have been following through second life and wiki architecture has been the open source architecture design competition via Open Architecture Network. Having conducted a number of experiments over the last year into the feasibility of applying an open-source paradigm to the practice of architecture, the Studio Wikitecture group developed a 3D-Wiki plug-in on the virtual reality platform, Second Life, that they used to help build consensus among the numerous contributors in this open-source project. 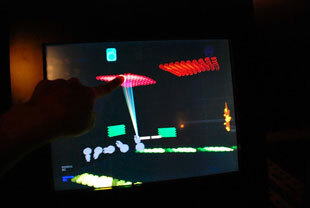 The ‘Wiki-Tree’ as it was called, acted as a version tracking system that worked very much like a conventional Wiki, but instead of tracking text documents in a linear history as you see in Wikipedia, the ‘Wiki-Tree’ tracked versions of 3-dimensional models and saved them within a continually evolving 3-dimensional digital tree ‘canopy’. Similar to Wikipedia, this 3D-Wiki allowed this loose, self-organized group of contributors to share ideas, edit the contributions of others, and vote on which design iterations should be considered for further refinement. Over and above the actual building design, Studio Wikitecture’s entry proposed that the wiki-tree and virtual model live on pass the competition and be used to help incorporate feedback from the Nepalese community and end-users into evolving design. In addition, they proposed that the virtual platform would allow individuals from around the world to experience the local site and conditions as the project evolves over time, further expanding the outreach, awareness and support for this project to a global audience. The winning entry was the result of Studio Wikitecture’s 3rd Wikitecture experiment to explore the procedures and protocols necessary to practice a more open and distributed approach to architectural design. Of those, the group explored prediction market voting procedures to assure consensus or ‘Crowd Wisdom’, as well as developed a contribution assessment system to divvy up fair ownership among all the contributors. This entry was posted in architecture, collaborative working, futures, innovation, News, open source, second life, virtual worlds, web2.0 and tagged wikiteecture on June 10, 2008 by martin brown.